As many knighthood competitions the actual Quintana Joust (Giostra della Quintana) is definitely something not to miss in Foligno, or during your first visit in Umbria. In the last few years the Quintana happens twice a year, with the first in June and the 2nd during September. La Sfida, the challenge, takes place in June, while La Rivincita, The Return Game is in September. In June the event is in nocturnal hours, lightened with floodlights on a Sunday evening, but in September it happens on a Weekend morning. 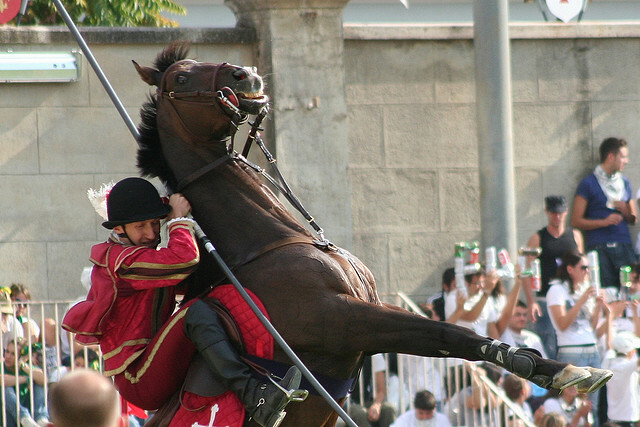 The Joust is associated with Foligno and is the most crucial occasion of the southern area since it underlines the beginning of summer celebrations. More and more personalities are joining the event giving the Quintana Joust more resonance in Italy. 1946 is the year of the first edition of the Joust. For 50 years now Foligno has celebrated this event that transforms the city in a magnificent Baroque revival, with marvelous costumes ornamented with laces, rich fabrics and many refinements to relive the 16th century splendor with chants and horse rides. The nights challenge each other representing the 10 districts of Foligno. Their names are Crocebianca, Cassero, Contrastanga, Ammanniti, Badia, Giotti, Mora, Morlupo, Spada and Pugilli. The prize is the Palio, a painted fabric on a post. The challenge of the joust happens in 3 stages. In each stage knights must spear 3 rings in succession. The rings to catch are smaller with each subsequent stage, passing from 10 to 6 centimeters in diameter. The winner is the knight catching all the rings and committing no penalties. The event begins with the Sprasanti Fair, where you can enjoy the historic revival of the district market and buy goods with the original money of the period. You will be allowed to change your money with the fair currency at the entrance of the fair. The nicest thing is that all districts have their own tavern, which will be open for the vent only and serve the best traditional Umbrian dishes. The whole event ends with the costume parade and the jousting.